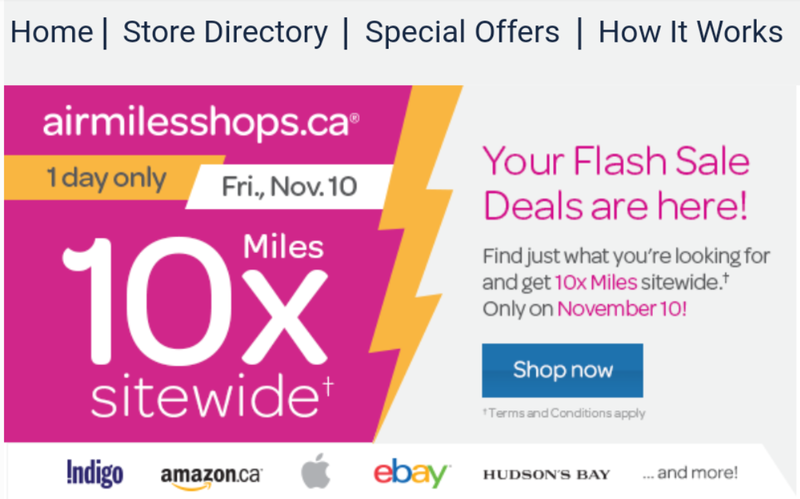 You can get 10X AIR MILES Reward Miles on qualifying purchases of $20 CDN or more, excluding shipping, duty and taxes, made in a single transaction from 00:00:01 AM to 23:59:59 PM ET on November 10, 2017. Collectors must sign in at airmilesshops.ca before purchasing in order to collect Reward Miles. Offer can be combined with other Bonus Mile offers. Offer is valid on the purchase of gift cards only at online stores who regularly offer Miles on gift card purchases. For travel online stores (including travel bookings, car rentals, and hotels), travel must be booked on November 10, 2017 and completed by February 28, 2018. Bonus Miles will be posted to your Collector Account within 75 days after the promotional period.